Explore advanced yoga poses separately and in depth. The Advanced Pose Library course will help you to consolidate your understanding of core Iyengar poses at the advanced level. These tutorials cover Iyengar yoga poses at the advanced level. Gaining a more detailed understanding of these asanas will help you with your ongoing practice. Outline: Eka Hasta Bhujasana belongs to a group of poses known as "arm balances". Excellent for improving overall body strength, it helps to bring freedom and stability to the wrists. It also develops the arm and abdominal muscles. As you continue to become more open around the hips and groins this pose will start to come more easily. With experience you will come to rely more on balance to stay in the pose, as opposed to brute strength. Expect that this pose will be both physically and mentally strengthening. Benefits: Strengthens arms, abdominal muscles, and leg muscles. Strengthens and mobilises wrists. Physically and mentally energising. Builds confidence. Focus: This weeks advanced class is devoted entirely to the arm balancing pose lolasana. For many people this is a notoriously difficult pose that is often avoided or thought to be impossible. This 20 minute, tutorial style class breaks the pose down into manageable stages that will be accessible to a broad range of people. Whether or not you are able to lift your body and swing like a pendulum, these stages will be beneficial in terms of strengthening your upper body, abdominal muscles, and legs. Familiarity with these teaching points will help to lead towards eventually practicing the pose with confidence. The quality of perseverance that this pose can foster should not be underestimated in the development of your practice. Focus: Niralamba sarvangasana is an unsupported version of shoulderstand that is practiced with your arms in a resting position. 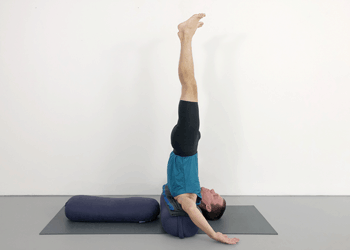 It can be a great shoulderstand alternative for anyone working with shoulder difficulties. It can also be a good option in restorative sequences, or times when you are working with lower energy levels. Balancing in the pose can at first feel a little precarious, but with perseverance, balance can be achieved with a quality of effortless lightness. This tutorial shows how to practice the pose without needing to use a wall. Outline: The first variation of Vasisthasana in this tutorial is therapeutic for wrists and shoulders. It can be practiced independently from the other versions of the pose. It helps to prepare the body for the more advanced weight bearing variations that follow. Eventually Vasisthasana is an “arm balance” where you support the body weight with just one arm. Like most of the other arm balances this pose strengthens the arms and the whole body. Once you are proficient with your balance you are ready for the final stage where you balance on one hand and foot. This final version of the pose gives a thorough extension to the leg muscles. This pose is energizing and builds a sense of balance, confidence and stability. Benefits: Strengthens arms, strengthens and mobilises wrists, physically and mentally energising, builds confidence.